This is not only the easiest pizza dough recipe ever but I also think it is the best. I have been making homemade pizza for years now and I think I have finally perfected it. When I first started making pizza and I used a recipe by Giada de Laurentiis. Her pizza dough recipe was always good but there was something missing that I could never quite put my finger on. Then 2 years ago I came across David Rocco’s recipe for pizza dough and his recipe called for a surprising ingredient that I loved… ½ Cup of White Wine. I’ve been making my pizza this way ever since. The white wine adds just that little bit of sweetness. 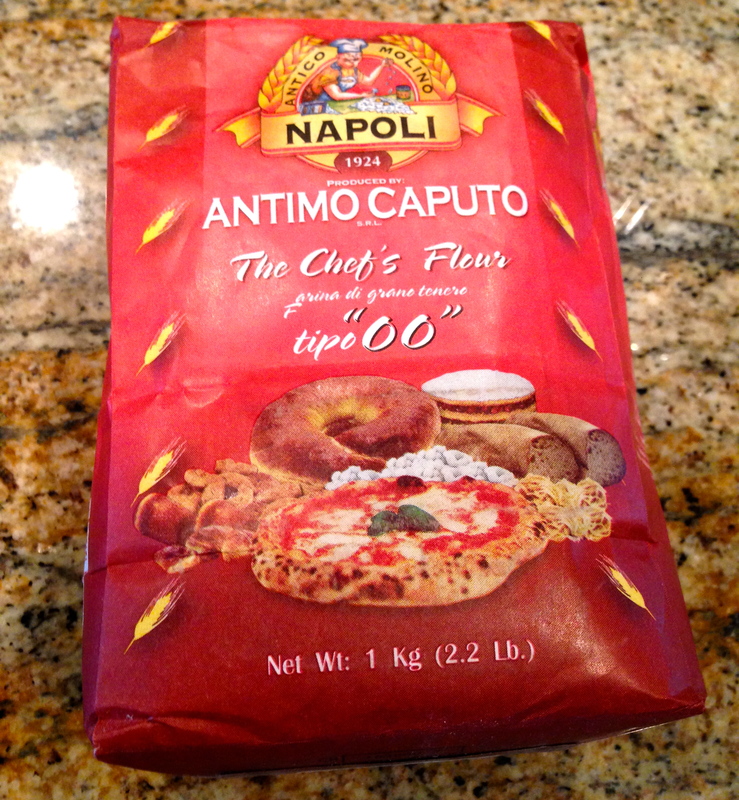 Another ingredient I have started using for my pizza dough is Italian “00” Flour. It’s the flour they use in Italy and let’s be honest they know how to make a pizza. The “00” Flour can sometimes be hard to find and a little more expensive than regular flour but it is totally worth every penny. I found my “00” Flour at Central Market it can be ordered online as well. The fine texture of the “00” flour makes for the prefect light, crispy crust. If you take the time to proof the dough overnight in the refrigerator not only will you get great flavor but you will get the perfect chewiness as well. Now I have to admit, when it comes to making my pizza dough I do cheat a little. I always mix up my pizza dough up in a food processor just until everything is incorporated then I knead it out by hand. I find this way to be the easiest and it keeps me from getting flour all over the kitchen…. Sometimes. For the sauce…. You can use your favorite store-bought marinara sauce or your own homemade sauce. But either way before you put the sauce on the pizza try these 2 steps. First, run your sauce through a fine mesh sieve to get out all the excess moisture. This will leave you with a thick and intense flavored pulp that will not water the pizza down. Second, make sure to apply a thin layer of Extra Virgin Olive Oil to the formed pizza dough just before applying the sauce. 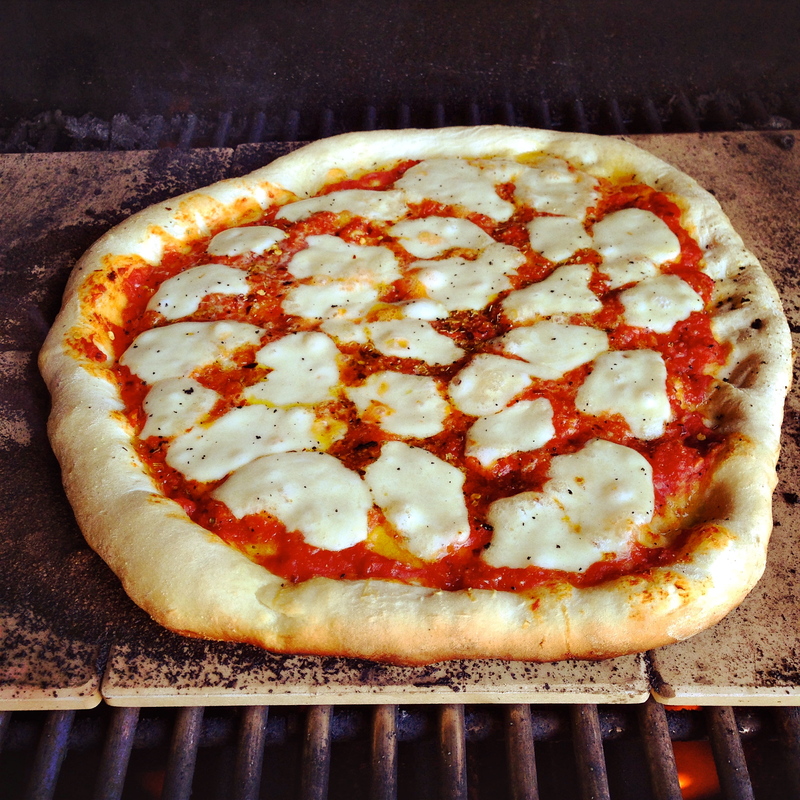 This step will help keep the crust crispy by creating a barrier between the sauce and the pizza dough. Finally for the cheese…. After I apply my sauce to the pizza I grate on a little fresh parmigiano reggiano cheese then I top my pizza with fresh mozzarella or scamorza. Scamorza is an Italian cow’s milk cheese similar to mozzarella but stronger in flavor. Scamorza is also favorite of the Neapolitans. Now… Who’s ready to make Pizza?? Place a damp damp towel over the dough balls and let them rise in a warm place for at least 1 hour or until it doubles in size. Pre-Heat the oven 450 or outdoor grill to 500 degrees. If using a pizza stone, make sure that is pre-heating as well. Once you have formed your pizzas, drizzle on a little Extra Virgin Olive Oil then spread a thin layer of sauce. Top with cheese and other desired toppings. Cook at 450 (Oven) for about 15 minutes or cook on the grill at 500 degrees for 7-10 minutes. Also if baking on a pizza stone make sure to dust the pizza stone with cornmeal to prevent sticking. Thanks!! I loved the piece about the shishito peppers. I had blistered shishito peppers this way at a sushi restaurant about a year ago and loved them. Now if only I can find them in Texas :). Right now we’ve got lots of hatch chiles coming in from New Mexico and they are dominating all the shelf space at the stores… Happy Cooking!! That does look like an amazing pizza! I didn’t know about the “00” Italian flour– but I know when we lived in Spain for a few years the flour there was better for making bread than cakes or pastries. Different wheat. So I’m going to try to track down this flour! thanks… Fun post!